Titled All American, the first of two programs presented by New York City Ballet during its week-long engagement at the Kennedy Center Opera House in April was dedicated to American music, featuring compositions of George Gershwin, John Adams, and Leonard Bernstein. 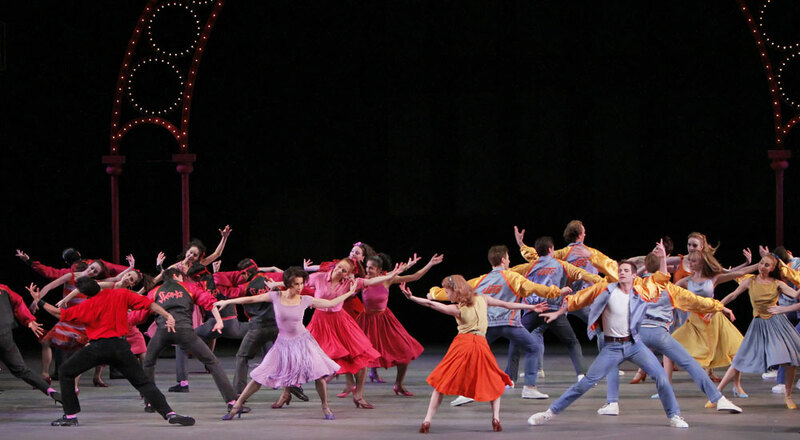 George Balanchine’s 1970 ballet, Who Cares?, which opened the evening is a heartfelt salute to New York and Broadway, Gershwin and Fred Astaire, and to romance and love in the Big City of Dreams. For the music Balanchine used a selection of songs by George and Ira Gershwin from 1922 to 1931. The lyrics were dropped and the music was orchestrated by Hershy Kay according to Gershwin’s own arrangements for the piano. The catchy title, like the ballet itself, suggests the era of the twenties, when American musical comedy was at its best. Choreographed as a collection of dances, varied in scale and character, including big strutting ensembles, romantic duets, and dazzling solos, Who Cares? encompasses the best traditions of American show dancing. I cannot think of any other work which makes the classical ballet idiom look so intrinsically American. In the vibrant, boasting ensembles of the ballet’s first part, Balanchine wondrously captured the spirit of the Jazz Age by incorporating into his choreography the elements of social dances of the 1920s such as the Charleston and the foxtrot. On opening night, the supporting cast, which included 10 ballerinas of the corps and five demi-soloist couples, performed with gusto, evoking a Broadway chorus line. A quintet of men in “Bidin’ My Time” was particularly impressive. Ashley Bouder offered a delicious account of the jazzy “I’ll Build a Stairway to Paradise;” and Ana Sophia Scheller shone in the “My One and Only” solo, zooming through its countless vertiginous turns with an effortless style and aplomb. The excellent Fairchild was in total command of his leading male role, which was part hoofer, part Prince Charming. Peter Martins’ Fearful Symmetries (1990), the second ballet of the program, is set to music of the same title – a propelling and relentlessly intense score by experimental minimalist composer, John Adams. On opening night, the Opera House orchestra sounded like an oversized big band, heavy on brass, wind and saxophones. The persistent rhythms of the music combined with its chugging, insistent beat (courtesy of a keyboard sampler playing percussion sounds) overwhelmed my ears with its unrelenting repetition and harmonic tension. Popular among the choreographers, the score has inspired nearly a dozen different dance versions, including award-winning choreography by Ashley Page for the Royal Ballet in 1994. In Fearful Symmetries, Martins conjured an exceedingly propulsive choreography to go hand-in-hand with the dynamics of Adams’ kinetic music. For much of the time the cast, dressed in various shades of red, surged and soared across the stage in diagonal or horizontal patterns, the energy of their rhythmic drive at times exceeded the staggering intensity of the score. At first the action onstage, with its countless entrances and exits, fleeting leaps, and swirling turns, all executed at breakneck speed, sparked my genuine interest, but after a while the repetitiveness of the movements, no matter how flawlessly executed, became as tiresome as the harmonic tedium of the music. Fortunately, Jerome Robbins’ West Side Story Suite, the final dance of the evening, was anything but tedious. One of the greatest entertainers in ballet, Robbins knew how to keep his audiences awake, engaged, and excited. In 1995, he transplanted his choreography from the 1957 Broadway classic West Side Story to the ballet stage. Choreographed to Bernstein’s original symphonic score, an amalgam of jazz, tuneful melodies, and heart-rending love songs, the new piece was a condensed version of the famous musical; in which one dance number seamlessly moved into another. In its fast-paced scenario the love story of Tony and Maria is given lesser prominence than on Broadway. West Side Story Suite is mostly about a gang war between the Jets and the Sharks, with its ferocity and intensity, all expressed as pure dance in an absorbing, realistic fashion. Tags: All American, Andrew Veyette, Ashley Bouder, Ashley Page, Ben Benson, Fearful Symmetries, George Balanchine, George Gershwin, Georgina Pazcoguin, Jerome Robbins, John Adams, Justin Peck, Kennedy Center, Kennedy Center Opera House, Leonard Bernstein, New York City Ballet, Patricia McBride and Jacques d'Amboise, Peter Martins, Robert Fairchild, Royal Ballet, Tiler Peck, Washington, West Side Story Suite, Who Cares?